I think it is being applied (because otherwise the image would look more distorted) - but can you confirm ? 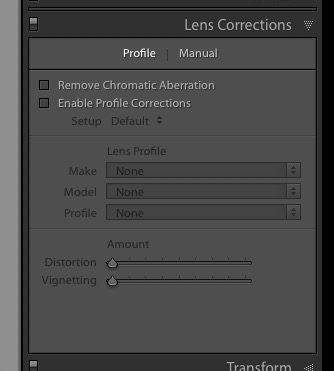 Screen shot shows the Lens Correction Panel - which should indicate it is being automatically applied. At the risk of stating the obvious are you selecting a raw file (.orf)? Camera JPEG files have the lens profile applied in-camera. They are, of course, raw .ORF files.....but the problem seems more complex. As I was confirming this last night I observed for a short while that a folder with ORF files that was NOT showing the Lens Correction notice earlier now WAS showing them. Then as I drifted back and forth over the Grid; and went in and out of Develop to confirm it ... the notifications that had previously disappeared; then re-appeared had now disappeared again. So, if you have a folder of MFT files, why not try it and see if you can re-produce this ????? Do you have LR Defaults saved by camera model AND ISO? If so then maybe some of the defaults you've saved didn't have Enable Profile Corrections checked. Steve, this is a Micro 4/3 camera that uses built-in lens profiles. Checking 'Enable Profile Corrections shouldn't be necessary and shouldn't make a difference either way (checked/unchecked). At least that's what I see with my Canon G9X MKII that uses built-in lens profiles. I've never seen 'None' in the Lens Profile Make, Model, and Profile fields with a raw file. That's what is shown if a JPEG or other non-raw file is selected, correct? I was trying to figure out a reason why it might be inconsistent between different photos; however, I think with LR 7.4 and a built-in profile which this lens has, it'll always say the same thing for ORFs regardless of the checkbox, the only difference being if the checkbox is enabled the top Make field will be non-greyed-out so a Make can be selected, which would enable the other two fields, in case someone had created an external lens profile for the camera and wanted to use it. Built-In is consistent with ORF with a footnote about there being a built-in profile. None is consistent with JPG with no footnote. Please prove it says None with an ORF by showing us a screenshot with the filename including the extension along with the None. You may be using a non-raw camera mode like HDR that produces a JPG despite the camera set to ORF or you may have landed on a non-raw Export or Edit-In-PS result TIF/PSD/JPG. If you do find an ORF that reads None for lens corrections, then upload it to somewhere like dropbox or googledrive or onedrive and reply with a public share link so someone can look at the file and determine what's up. Ok, I kind of do know what I'm doing here so I can assure you it is a real, raw Olympus ORF file. There is a difference in behaviour between R7.4 and the beta candidates and 7.3. So, yes this is a bug that was introduced sometime in the timeline before the final 7.4R; so we ought to have the engineering team commenting on this as a BUG report. So what I was asking is for anybody else to upload a 4/3 raw file from their cameras - preferably a different manufacturer like Lumix, to ensure it is not a setting in my Catalog or Profile settings. I can assure you that older ORF files on my system (Catalog) are now exhibiting this fault (even with an EM-1 Mk I), and same files from other people I have using Lumix and other Mk II's. So, there IS an issue here - but I would like to have you confirm it with your Catalog. Here's a link to an ORF on DropBox that you may import. OLY EM-1 Mk II. And here is a screen shot showing you the full details of the shot as it appears on my Catalog. My Preferences as regards linking "Defaults" to specific camera models and/or ISO's are not checked - nor have they EVER been. So this is consistent over many releases. And I should re-iterate that I observed an intermittent example of this behaviour when, for some moment, the report of the Profile DID appear in the sub-panel ... then subsequently did not. Finally, I suspect this is an issue somewhere with Profiles. I have spent some time selecting and changing different ADOBE supplied Profiles and it remains the same. ### Update #### - I think I have found the issue. It's related to Smart Previews and whether they have actually been generated and how your Preferences are setup. What I noticed when comparing Catalogs with my laptop is that the message "(I) Builtin Lens Profile Applied" fails to display if you have "[ ] Use Smart previews instead of Originals ...." ticked but you do NOT have the Smart Previews generated - which can happen if you don't routinely generate them on IMPORT. Flicking the option ON / OFF in Preferences and alternating back and forth between images in the Film Strip while in Develop will cause the message to be correctly/in-correctly displayed. When the Smart Previews are present, the information is displayed correctly. Thanks for working with me on this.....I will cross-post to the Beta site. The lack of built-in message is technically correct IF the smart-preview has the camera-supplied lens-correction op-codes applied before the creation of the reduced-size smart preview and the lens-correction op-codes are deleted from the metadata to save space, then there'd be no way to know from the smart-preview that a built-in lens-profile had been applied, without Adobe adding back a flag that says it has. Does Adobe's desire for a consistent experience with smart previews vs original raws (always displaying the built-in message) outweigh optimizing efficiency by not having to flag each smart preview merely to tell us a built-in lens profile was applied before the smart preview was created. What does Adobe do, now, for DNGs that are created as a result of the Panorama process from MFT-camera raws, do they say a built-in lens profile has been applied, or not? Obviously for a panorama a lens profile wouldn't be applicable anymore despite the image data being raw-ish because the aspect ratio is different and the source raw data has been warped to match things for stitching. Now if smart previews still have lens-correction op-codes and they are being applied each time by LR, then the lack of message is more of a bug. I suspect this is not the case. "What I noticed when comparing Catalogs with my laptop is that the message "(I) Builtin Lens Profile Applied" fails to display if you have "[ ] Use Smart previews instead of Originals ...." ticked but you do NOT have the Smart Previews generated - which can happen if you don't routinely generate them on IMPORT." "Flicking the option ON / OFF in Preferences and alternating back and forth between images in the Film Strip while in Develop will cause the message to be correctly/in-correctly displayed. When the Smart Previews are present, the information is displayed correctly." So the issue in question is whether or not the 'Built-in Lens Profile applied' message should be displayed when a Smart Preview has NOT been created when 'Use Smart previews instead of Originals' has been checked in Preferences. For consistency it makes sense to display the message whether or not the Smart Preview exists. It can't be turned off in the Lens Corrections panel so it should always be displayed. BTW- I checked a Canon G9X MKII CR2 file's Smart Preview DNG file in Rawdigger and the Lens Profile is applied BEFORE the DNG file is created as you suspected. That makes more sense, it's a transient condition. The "if available" for Smart Previews isn't being applied to when the check is done for built-in lens profiles. I wonder what happens with a non-MFT situation with an external lens profile, does it somehow not get applied during the same transient period of time?